Submitted by Nick Brutus Gra... on August 6, 2018 @ 3:54pm. From time to time, you fall onto something by mistake, and it changes you a bit. That's what happened when I discovered Visually Tasteful. Hailing from Montreal (Laval, more specifically) - this creative visionary really grabbed my attention when I saw one of the photo projects he did with our homie High Klassified, and I had lurk some more. Utilizing different mediums such as video and photography, the overall style is hard to pin-point and categorize in itself. However, you will find a mixture of portraits set in surreal environments, sharp shadows and almost perfectly saturated colours that make you dream of a new world. We asked if the man behind the vision if he was down to do a lil' Q&A and he delivered. Scroll through below and get to know him a bit better. Can you describe Visually Tasteful in under 140 characters? VT is a creative ecosystem curating, tastefully interpreting and nurturing creatives around contemporary culture, fashion, art and music. VT + creators, so it’s indefinite. When did you start this collective and what project kicked it all off for you? VT started in 2015. We were behind the creative direction for the album BODIES by Montreal duo Fabrikate. We collaborated with great artists including Daniel Bruno Ferreira, Isabella Forget, Patrick G Nadeau and the whole crew from Five Knights in collaboration with House of Youth studios to produce this project. And we really went to the core of the music to depict it in a visually tasteful manner. What inspires you the most to the point where you know you wanna start a project? When the project/ subject has a character/ persona. When one is truly themselves in their craft. When we see how passionate the person is behind their project. When it has great potential. You've worked with a bunch of cool cats from the underground urban scene in Montreal, more notably High Klassified and JT Soul. How did this work out? Did you approach them or was it the opposite? They just sort of happen, it’s half-half to be honest. People who approach us, is for our style/mood and the people we approach is because of their taste. For JT Soul, his label Oddio had approached us. With High Klass, he knew my little sister, we appreciated each other’s work and style, we’re both from Laval. We linked up for a creative day and clicked since. Does the city of Montreal inspire you in any way? If so, what? how? why? What inspires us are the people within our city. Montreal has so much potential to be the driving force and being recognized for its creativity. People in our city are far more in touch with their creative side and we’re there to support them visually. Your photography work is different than what we usually see from local photographers. What is your process when editing the photos to make them look out of this world? Our process is to truly understand the universe of the person we’re working with. Every person/ brand tells their story through their craft. So we try to immerse them within their own. If you had to pick one gif to really encompass the vibe and aura of Visually Tasteful, what would it be? Any upcoming projects you are working on that you can tease? Yesss! 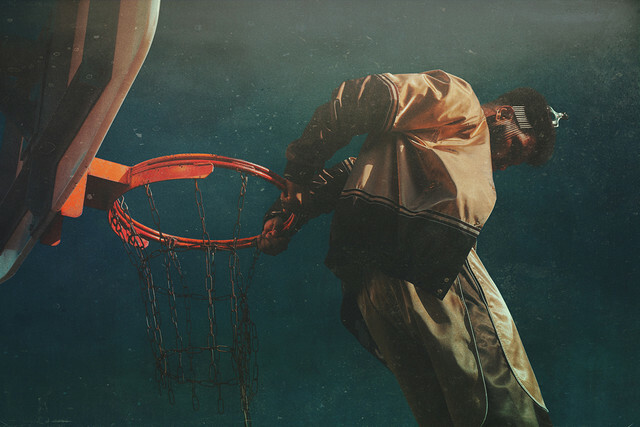 High Klassified is working on a new EP called Kanvaz, which we’re very excited about. Also working on content for Gxlden Child & Chris James.